Our product range includes a wide range of briquetting plant, briquetting unit and fuel briquetting unit. Keeping in mind the varied requirements of our prestigious clients, we put forward a wide range of Briquetting Plant. 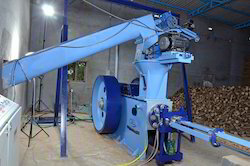 Our professionals perform a series of test on various parameters, in order to ensure the quality and functioning of this hi tech briquetting plant unit. Extremely robust and built with quality tested components, this briquetting plant unit is highly durable and can withstand even the roughest conditions. Clients can avail this briquetting plant unit from us at industry leading rates. Briquetting Plant Unit can also be designed as per the type of waste available locally. 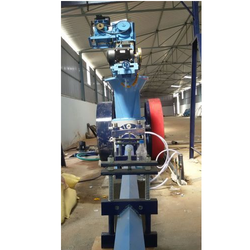 The Briquetting Plant is a crank type mechanical press with two flywheels. One flywheel is driven by the main motor through a continuous Flat Belt along with other. Cooled and Filtered lubrication oil is supplied by the pump through pipes which circulates the system guarantees a long & smooth service life to the machine. Material is continuously fed through flexible pulley/drive fitted with motors. From feeding chamber material is compressed by ram through taper bore die. Briquettes come out from cooling line. Owing to our extensive years of industry experience and profound market understanding, we are providing a wide gamut of Briquetting Unit. These briquette units are prepared by utilizing optimum quality components that are procured from the reliable vendors of the market, and the latest technology. Briquette units offered by us are scrupulously tested on various quality parameters and are widely applauded among the clients. We provide these briquette units to our esteemed clients at nominal price. With consistent focus on current market, we are presenting a wide collection of Fuel Briquetting Unit. Increasing popularity of our offered range in the market remains directly attributable to its trouble-free functioning and user-friendliness. We manufacture the entire range using quality-proven components and modern technology in compliance to the industry defined guidelines. Moreover, every stage of production is passed through various quality tests. Expected range of price is easily affordable.